Now that summer has arrived, it is officially smoothie season. I LOVE SMOOTHIES and one of the best kitchen items I ever purchased was my Ninja. Not only is it good for making smoothies, but you can make soup, salsa, and tons of other fun stuff. This isn’t a sales pitch so I will just get to it. Smoothies can be an overload of sugar, carbs, and unnecessary calories. Luckily, if you have the right measurement of the good stuff you can make sure your smoothie is equally as nutritious as it is tasty. I have many recipes that have been tweeked to perfection in my kitchen, but this is my go-to smoothie. It is full of random stuff, but never disappoints and always gives me the energy I need to get through the morning. The first thing I throw in is the spinach/kale. With kale you have to be generous with your fruit or light with your kale if you don’t want you smoothie to be taken over by that bitter taste. I put the veggies first so they are closest to the blade and so they are pulverized. 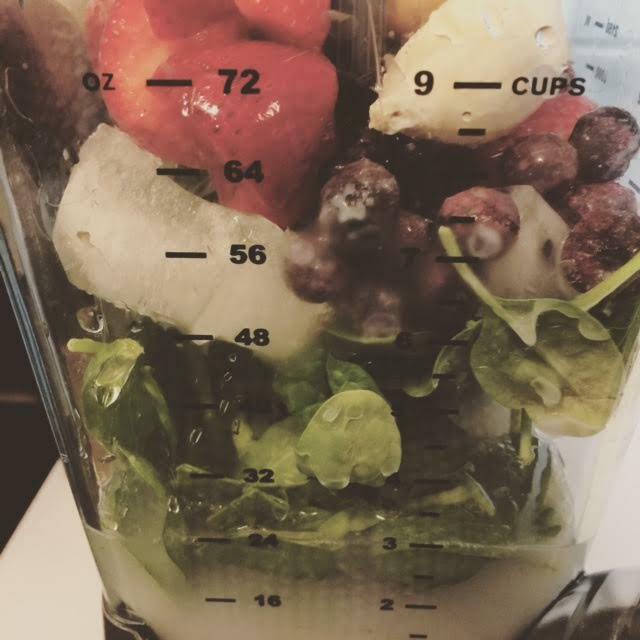 No one likes chunky leaves in their smoothie. Next, add in your fruit. I try and get my fruit fresh when possible. I suggest getting it at a local farmers market, chopping it up, and freezing it. 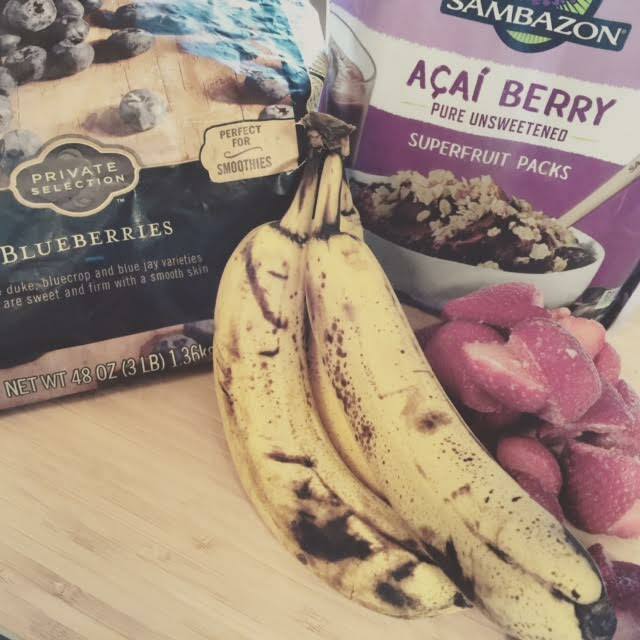 Strawberries, blueberries, raspberries… oh my! I also really love these UNSWEETENED acai packs you can get at whole foods. Don’t forget your banana either. I can’t have a smoothie without a banana in it! After the fruit, add one scoop of peanut butter (also provides smooth consistency to your drink) and a scoop of protein powder. There are a million different protein powders you can use, my favorite is the dutch chocolate Isopure. It is the one protein powder I have found is lowest in carbs and tasty in flavor. It adds such nice sweetness to the smoothie. You can buy this on amazon! Put in one scoop of chia seeds or flax. These will keep you full and flax will aid in your digestion. A little goes a long way. Don’t incorporate too many of these – your smoothie will turn into a gelatin blob from the seeds absorbing moisture! Honey is optional. I say this because it is a natural sweetener – add if you need it. I personally don’t find it necessary after the addition of banana and protein powder, but maybe you have an extra big sweet tooth. No judgment here. Top everything off with a 1/4 cup of almond milk, 3/4 cup of water, and a couple ice cubes. You can experiment with these measurements and find the consistency you like. I don’t like my smoothies too thick so sometimes I will give an extra splash of water. I am inpatient and used to take my smoothies out after about 60 seconds. Give it a few minutes. The longer you have it in the blender the smoother it will be. Pour in your blender bottle and hit the road. This is the best breakfast on-the-go anyone could ask for! *Try to make your veggie to fruit ratio equal. You still won’t taste the veggies if you do half and half and you are being healthy while you treat yo’self. *NEVER use fresh pineapple with any kind of dairy. It whips up so smooth you will have impressed yourself, only to find you have a cup full of curdled milk a minute later. Acid + Dairy = don’t mix. *If you freeze all of your fruit you won’t need ice. Jamba juice doesn’t put any ice in their smoothies. That is why they are so smooth. EVERYTHING they use in the smoothie is already frozen before being scooped in. This also prevents your drink from being watered down. *If you prefer dairy, adding a flavored greek yogurt to ANY smoothie will make it even tastier, add to your protein intake, and keep things really smooth and creamy. 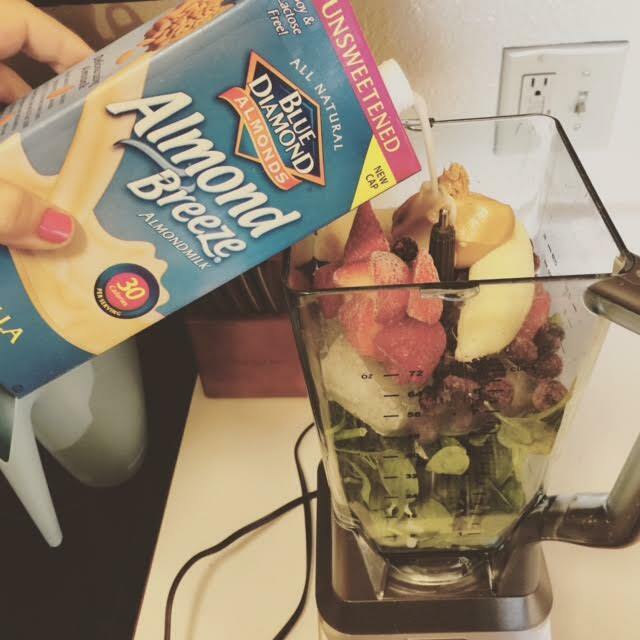 *Sometimes throwing in random ingredients as you go makes the best smoothie.